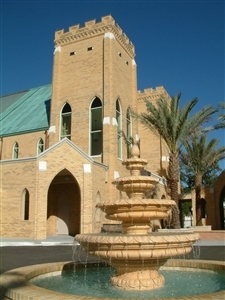 TAMPA – In less than a week, volunteers and staff at Hyde Park UMC will welcome almost 600 attendees from large churches across the U.S. to their stately campus a short drive from downtown Tampa. The three-day event starts Monday, and guests will be pastors and staff who signed up early for this year's Large Church Initiative (LCI), which has been sold out for weeks. And it may be important to note that the moniker refers to the size of congregations represented, not necessarily the church campus. 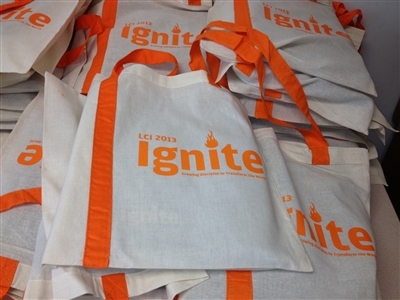 Unpacking hundreds of tote bags and getting them ready to distribute to guests is one of many tasks volunteers and staff are doing to prepare for the 2013 Large Church Initiative, a national UMC event. Photo by Martha Chamberlain. That's why the Hyde Park planning effort required some extra finesse, said Barbara Stefany, who is heading up that part of the process for the church. Early in the planning stages, she talked to organizers of last year's event at First UMC in Richardson, Texas, which reportedly drew about 550 attendees. Hyde Park's patch of earth is not small, but last year's site near Dallas was much bigger. "They said that they didn’t have any idea of the scope of this event, and we didn’t either before," Stefany said. "It's so massive and there are so many moving parts … but we know it’s all going to come together." Taking into consideration the weather and other variables, Stefany said she has created a 37-page timeline “on every breath we’re going to take," including feeding people in shifts so that a hall that routinely accommodates 250 to 350 can host meals for everyone. The theme for this year’s event, supported by the General Board of Discipleship, is “Ignite: Growing Disciples to Transform the World.” Speakers include some of the best known movers and shakers in The United Methodist Church, including Revs. Adam Hamilton of the Church of the Resurrection in Leawood, Kan., and Olu Brown of Impact Church in Atlanta. Click here for more details. Rev. Tim Walker, chairperson of The United Methodist Church committee that chose Hyde Park for the event, said the committee looks for churches that have a proven track record of best ministry practices for congregations that average between 350 and 1,200 in weekly worship attendance. “We look for host churches that are led by a lead pastor who has a history of energizing and growing the congregation, have a lead pastor who has some tenure, and a congregation that has a theme or focus that can be shared," Walker said. "Hyde Park has an approach to church membership and discipleship that can serve as a model for other congregations,” added Walker, who has known Dr. Jim Harnish, Hyde Park senior pastor, since they were in seminary together. That leaves the nuts and bolts of putting on such an event to the Hyde Park faithful. Hyde Park UMC's tranquil campus will be bustling with guests during the Large Church Initiative scheduled for April 22-24. Photo from Hyde Park UMC. "Our planning is being led by a lay leadership team excited about sharing their expertise and gifts in service not only [with] Hyde Park but the greater UMC connection,” said Martha Chamberlain, director of church operations and communications. Jobs taken on by lay persons range from Stefany's overall event planning to people signed up to be greeters, ushers, parking assistants, administration helpers, guides, food servers and more. With Florida known for its unpredictable weather, Stefany has had many worst-case scenarios playing out in her head during the weeks leading up to the event. Along the way, members of the planning team have faced personal family problems and serious illness that knocked some important players out of the process for a while, Stefany said. “We’ve just had a lot of things that might throw another group into a tailspin, but we really haven’t skipped a beat," she said. Cindy Totten, in charge of hotel and transportation coordination, started working on the event in October. Her experience working on a committee for General Conference greeters at various local hotels last year gave her a leg up on the LCI needs. “We have had so many members who’ve been willing to pitch in and help, and it’s true: Many hands make light work,” Totten said. Walker said he is looking forward to the gracious hospitality at Hyde Park.